Invited talk ‘Werken met audiovisuele bronnen’, DH Clinics, Dag 5: Werken met audiovisueel materiaal en geografische informatie, 28 November 2017, for PPT presentation slides click here. Paper ‘Representing the social acceptance of migrants in the Netherlands as both a disruptive and lucid narrative.’ Panel Current Affairs on TV, ECREA Television Studies Conference 2017, ‘The Future of European Television: Between Transnationalism and Euroscepticism’, 15 November 2017, Facultad de ciencias de la Comunicación Málaga, University of Málaga, Spain. Chair opening keynote session of the lecture ‘Traveling Europe: Digital television heritage as gateway to a future European Television (Historiography)’ by prof. Sonja De Leeuw, ECREA Television Studies Conference 2017, ‘The Future of European Television: Between Transnationalism and Euroscepticism’, 15 November 2017, Facultad de ciencias de la Comunicación Málaga, University of Málaga, Spain. event,’ Panel Critical perspectives on historical events and the role of the archive, IAMHIST 2017 XXVII conference ‘Media History and Violence’, 12 July 2017, University Paris 2 (CARISM), Paris, France. Chair panel Public and historical figures, IAMHIST 2017 XXVII conference ‘Media History and Violence’, 10 July 2017, University Paris 2 (CARISM), Paris, France. Workshop ‘Digital exploratory search: Discover new research questions and create narratives with audiovisual sources’, Berber Hagedoorn and Sabrina Sauer, Digital Humanities Day 2017, 26 October 2017, University of Groningen, Groningen. Paper ‘Getting the Bigger Picture: An Evaluation of Media Exploratory Search and Narrative Creation.’ by Berber Hagedoorn and Sabrina Sauer. DHBenelux 2017 Conference, 4 July 2017, Utrecht University, Utrecht. Panel ‘A Pragmatic Approach to Understanding and Utilising Events in Cultural Heritage. by Lora Aroyo, Chiel van den Akker, Marnix van Berchum, Lodewijk Petram, Gerard Kuys, Tommaso Caselli, Jacco van Ossenbruggen, Victor de Boer, Sabrina Sauer and Berber Hagedoorn. DHBenelux 2017 Conference, 5 July 2017, Utrecht University, Utrecht. Invited talk ‘Exploring linked open data with DIVE+: searching for audio-visual sources to discover new research questions and create narratives’, Sabrina Sauer and Berber Hagedoorn, CREATE Salon: Digital Search & Storytelling in History, 9 May 2017, Media Studies Department, University of Amsterdam, Amsterdam. Panel IFA Perspective (on Jackie (2017), International Filmfestival Assen ‘Vrouw en Film’ [Women and Film], 12 March 2017, Assen, The Netherlands. Paper ‘A European Comparative Approach to Studying AV Representations of the Past.’ ECREA 2016, 6th European Communication Conference on Mediated (Dis)Continuities: Contesting Pasts, Presents and Futures, 11 November 2016, Charles University, Prague, Czech Republic. Keynote speech ‘How Televised History Contributes to Cultural Memory.’ Serialised Storytelling international conference ‘TV series in contemporary societies’, 18 July 2016, Hanze University of Applied Sciences, Groningen, the Netherlands. Paper ‘Reflections on A European Comparative Approach to Studying Audio-Visual Representations of the Past’ Summerschool ‘Screened Memories: Historical Narratives and Contemporary Visual Culture’, 1 July 2016, Central European University, Budapest, Hungary. Invited talk ‘Gedigitaliseerd AV materiaal en academisch onderzoek.’ Symposium Photography Research in the Digital Age, Panel ‘Wat levert digitalisering in fotografie op voor…Onderzoekers?’, 11 December 2015, Paradiso, Amsterdam, the Netherlands. Invited talk ‘Doing History, Creating Memory’. Research Colloquium ‘Art, Medium, Moving Images’, 8 March 2016, University of Groningen, Groningen, the Netherlands. 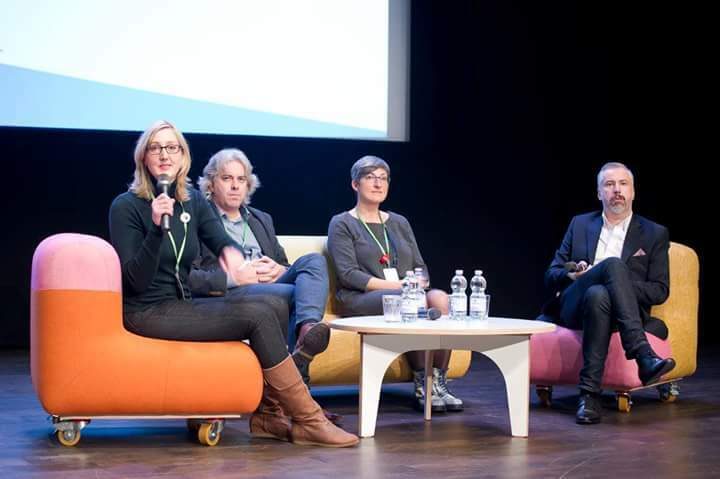 Chair panel Transmedia Storytelling For Archive Materials, Final EUscreenXL Conference ‘Content in Motion Curating Europe’s Audiovisual Heritage’, 18 December 2015, Warsaw, Poland. Paper ‘Television as a Practice of Cultural Memory’. Symposium ‘Understanding agency in memory transmission across cultural borders’, 14 April 2015, COST Action IS1203 ‘In search of transcultural memory in Europe’ (ISTME), Kaunas, Lithuania. Paper ‘Tell and show: developing a tool for online publication of AV research’, by Berber Hagedoorn and Willemien Sanders. IAMCR International Conference, 14 July 2015, Panel Digital Media and Visual Culture. Montreal, Canada. Chair panel ‘Perspectives on the Contextualization of Audiovisual Online Archives: Access and Publication Formats’, by Berber Hagedoorn (chair), Mariana Salgado, Dana Mustata and Eleonora Mazzoli. NECS conference ‘Archives of/for the Future’, 20 June 2015, University of Łódź, Łódź, Poland. A Workshop on Contextualization, or: How can AV contextualization practices benefit best from the affordances of online publication, by Berber Hagedoorn, Willemien Sanders, Mariana Salgado, Daniel Ockeloen and Eleonora Mazzoli. Workshop on Contextualization, EUscreenXL Conference From Audience to User: New Ways of Engaging with Audiovisual Heritage Online, Rome, Italy (31-10-14). Paper ‘AV in DH: How to publish AV research online’, by Berber Hagedoorn and Willemien Sanders, AV in DH 2014 workshop, Digital Humanities 2014, University of Lausanne, Lausanne, Switzerland (08-07-14).